I am preparing for our move to Japan by reading as much as I can about the country. 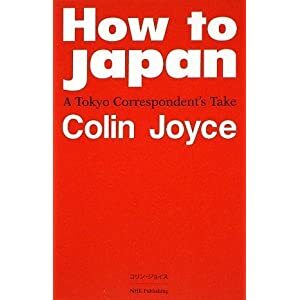 During the flights to South America, I read, “How to Japan: A Tokyo Correspondent’s Take” by Colin Joyce (2009 NHK Publishing) He is an English journalist and worked for the Daily Telegraph and Newsweek Japan Magazine and lived in Tokyo for over 15 years. The book is explaining Japan for Westerners, but was first published in Japanese for the local market in 2006. This is the English translation of the book. The author’s love for Japan shines through and it gives insights into the culture from someone who has lived there for a long time. As with all foreign correspondents, his personality and personal tastes color the topics and views expressed. I liked him being touched by the politeness, empathy, pride, and sense of community most Japanese express in their daily lives. He was truly changed by his experience and I hope to be influenced as well. There are some things I learned from his observations that I will definitely be thinking about when I live there. He loved going to the public baths (sento) and I recall the spas of the Baltics that I enjoyed, so I will be checking these out. Joyce also pointed out the well-thought out design of things, ranging from way people read a newspaper to the actual book, which is small to be portable and cheaply made, which is savings for the consumer, and not to have Western publishers “adding value” (greed) to books with fancy covers and hard covers that add to the price of books. I also learned that Japanese are “foodies” and appreciate and discuss food in detail and seriousness. • buy slip-on shoes, which will save loads of time when entering/leaving Japanese homes. • learn 20 words before you come, he suggests adjectives like oishii, atsui, natsukachii, sugoi, kirei, omoshiroi, – the people will appreciate it. • In England, you probably try to own as much stuff as possible, in Japan, this urge must be tempered by rigorous reference to how much space you have in your apartment. • Japanese people in a Japanese company can’t leave without doing hours of overtime, you can.